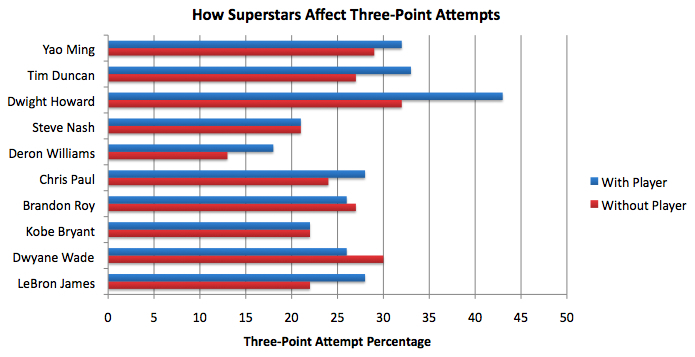 Basketball-Statistics.com » Blog Archive » Do Superstars Increase Their Teammates’ Three-Point Attempts? A check for stars good at setting up open looks by the basket for teammates would be another good list. The stars who create the most 3 point attempts + inside shots for teammates are likely to have the most cumulative positive impact on teammates. hmmmm…. interesting indeed. Think the HEAT had more 3pters with wade on the court in 2006 for instance when wade had better teammates and shooters around him? but kobe’s team in 06 sucked so they probably hadmore 3pters with him off the court than with him on it, despite the constant doubleteams and packing the paint, right? Could you go a little further down the superstar totem pole; get guys like Chris Bosh, Danny Granger, and Andre Iguodala in? 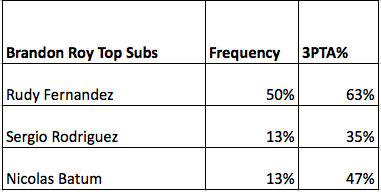 Can you provide numbers for the variance in 3p% with\without these superstars? It’s one thing to increase attempts, and it’s very sound assumption that generally speaking – that’s a good thing. But to what extent? I wouldn’t treatment method who indicate, i enjoy this sort of trainer. Individuals whine concerning the excellent, yet hi, it is great sufficient to me. They could be as a result cozy. In keeping with measurements.They may be lovely along with accompany generally any garments. I propose every person to get these.